The prestigious first prize - in the 29th year of BP’s sponsorship of the competition - was won by London based artist, Miriam Escofet for An Angel at my Table. Miriam Escofet was born in Barcelona and moved to the UK in 1979. Escofet graduated from Brighton School of Art in 1990, where she studied 3D Design, and began painting soon after. This is the fifth time Escofet has been selected for the BP Portrait Award exhibition. 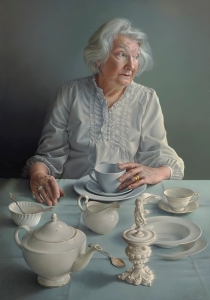 She has also been regularly selected for The Royal Society of Portrait Painters’ annual exhibitions and was awarded the Burke’s Peerage Foundation Prize for Classically Inspired Portraiture in 2015. The second prize of £12,000 went to American painter, Felicia Forte, for Time Traveller, Matthew Napping. Time Traveller, Matthew Napping finds Forte’s sweetheart Matthew DeJong asleep on a sweltering summer’s day in Detroit. 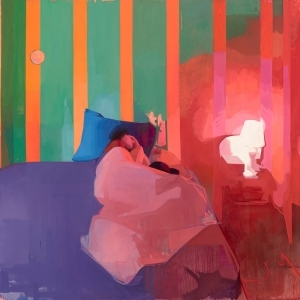 Forte says she was struck by the beautiful contrasts in the scene - the ‘cool light from the window meeting intense red light from the bedside lamp and the loneliness of the sleeper amidst the festive colours.’ The portrait was the culmination of a body of new work made in summer 2017 in residence at Redbull House of Art in Detroit. The judges were particularly impressed by the artist’s bold use of colour, creating a painting that exudes atmosphere while also being distinctly intimate and personal. The third prize of £10,000 went to Chinese artist, Zhu Tongyao for Simone. Zhu Tongyao was born in Jinan, Shandong and attended China Central Academy of Fine Arts and the Academy of Fine Arts of Florence. Tongyao has exhibited in Italy and China and in 2015 was awarded first prize in the Florence Biennale - International exhibition of contemporary art. This is the first time Tongyao has entered the BP Portrait Award. 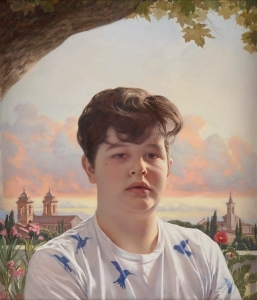 The judges appreciated how the work combined the tradition of Renaissance portraiture with the sitter’s modern style that conveyed a compelling portrayal of a youth on the cusp of adulthood. 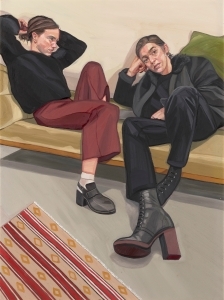 The BP Young Artist Award of £9,000 for the work of a selected entrant aged between 18 and 30 has been won by 28 year-old Suffolk based artist Ania Hobson for A Portrait of two Female Painters. A Portrait of two Female Painters, depicts the artist with her sister in law Stevie Dix and explores the relationship between the two of them as painters working in the studio together. Hobson used an upward perspective to allow the viewer’s eye to map the portrait and convey a feeling of confidence and creative energy which celebrates female painters today. The judges liked the handling of paint and directness in this work, capturing an interesting air of mystery around the relationship of the two young women. The winner of the BP Travel Award 2018,an annual prize to enable artists to work in a different environment on a project related to portraiture, was Robert Seidelfor his proposal to travel along the route of the river Danube by train, boat and bike to connect with people and make portraits in the regions through which the river passes. The prize of £8,000 is open to applications from any of this year’s BP Portrait Award-exhibited artists, except the prize-winners. The exhibition will also include the work that resulted from The BP Travel Award 2017 which was won by Casper White for his proposal to create works about music fans in clubs and concert venues in Berlin and Mallorca, representing an often youth-related subculture that is not traditionally recorded in portrait paintings. A fully illustrated catalogue featuring all forty-eight selected works will accompany the exhibition. The catalogue also includes an essay by curator and judge Rosie Broadley, an illustrated interview with the BP Travel Award 2017 winner and interviews with the prize winners. The catalogue, priced at £9.99, is out now. Winchester Discovery Centre (March – June 2019).